Scientific dating of ‘Fortified-walls’ around the Dholavira archaeology site in Kutch, Gujarat dates back to over 6000 years claim scientists from CSIR-National Institute of Oceanography. According to them, earlier misunderstood for reinforced forts to protect the port-town from enemy invasion, was in reality meant to protect the city from tsunami. The discovery, made by a group of Marine Archaeologist of NIO in February this year, was based on a scientific probe and preliminary excavation. Wall measuring thickness about 15-18 metres surrounded Dholavira, which the initial team of Archaeological Survey of India (ASI) led by R.S. Bisht concluded that the fortified structure was either protection wall or a reservoir, but it could be scientifically explained. “It was only recently when we tried to probe using Ground Penetrating Radar (GPR) and basic excavation that realised we discovered that it was far more broader for a enemy retaliation and did not show signs of reservoir,” Dr. Rajiv Nigam, Consultant and former Head of Marine Archaeology Unit said. According to Nigam, study of Oceanography showed that Makkran coast that was close to Bhuj was a highly tsunami prone area and their research study indicated that the earliest recorded tsunami in the region was about 8000 years old. 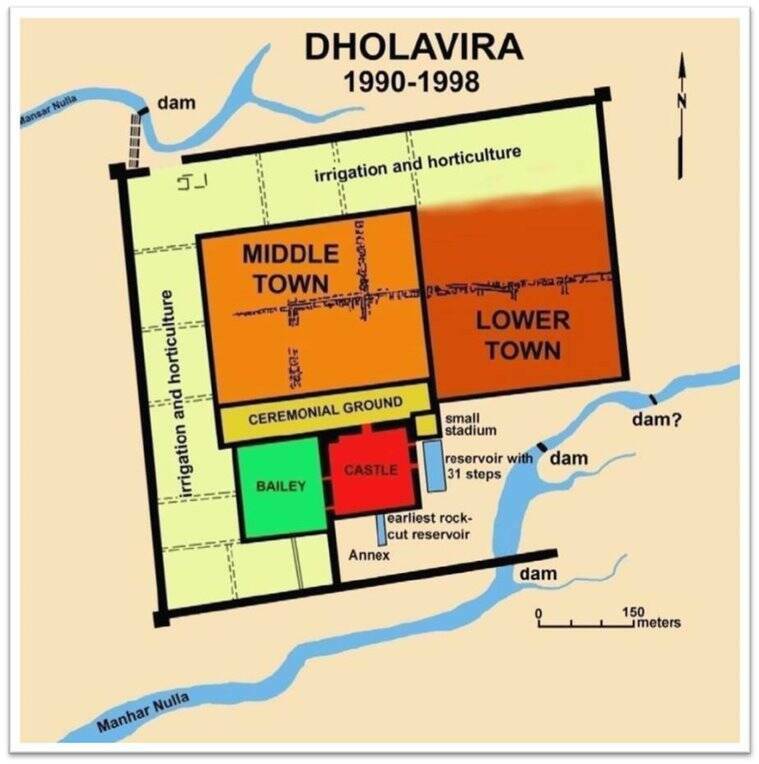 “So when the Dholavira was raised, the builders who had knowledge about the former catastrophe wanted to secured the walls from Tsunami and storm. The model of the wall is similar to that of 400 kilometre ‘sea-wall’ that Japan is said to have started last year, of course given the use of concrete material these days the width of the sea-wall, we have learnt is 12 metres, but the idea is the same. It means our ancestors were aware of Tsunami and succeeded in creating a defence to it,” he said. For the third-leg of the probe, the NIO team says it has already received the approval from the Archaeological Survey of India for further exploration at Dholavira. However the ambitious ‘discovery’ project has hit a dead-end due to impending financial impetus from Gujarat Council of Science and Technology. “It has been over nine-months since we sent the proposal to Gujarat Council of Science and Technology, but we have not received any update from them. It’s disappointing as we could have fastracked the discovery and probed if the ancient indigenous ‘Tsunami-wall’ was capable in deterring the catastrophe in modern times, since till date no reliable warning system has been found for the deadly ‘seismic sea wave’,” said the NIO team. Kutch is bellow sea level because the sea raised and forced down the continent, like a lever. West India doesn't go to too deep, but it goes very far into the ocean. That probably caused cracks close to the surface and tsunamis.